The Amish Pioneer Mission Footstool invites you to relax. So much more than a footrest, this gorgeous mission stool features signature mission slatwork on the sides and a soft upholstered center. Footstools make excellent mini-tables and additional seating when you're entertaining. Style this footstool in the wood selection and upholstery that best fits your decor. Our custom furniture options make it easy for you! 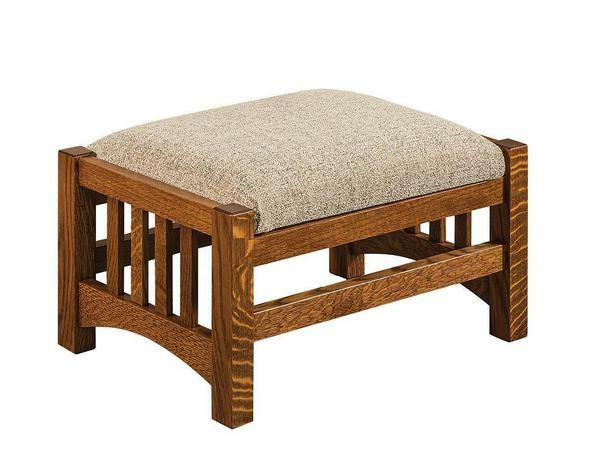 The Amish Pioneer Mission Footstool is part of our Arts and Crafts Furniture Collection. Amish made means all the little details that go into making high end furniture are present including solid wood throughout and mortise and tenon construction for the strongest joints. This footstool can withstand the rigors of daily use for generations and will still look gorgeous doing so. We are happy and eager to help with your purchase. Please contact a Furniture Specialist with any questions. Email at Questions@DutchCrafters.com or call toll-free at 866-272-6773. Thank you for shopping with DutchCrafters. We received our beautiful furniture and were overwhelmed by the quality, heft, and sheer beauty of it. The cushions are comfortable and beg you to sit on them. The wood is solidly constructed and I have no doubt my grandchildren will see this furniture in time. It has that heirloom feel. I am pleased with your information over the time the furniture was being created. It was exactly 12 weeks from start to finish. It was truly worth the wait, as there is no furniture available in stores that have the wood, the finish, the style nor the fabric or cushion that would have met the choices we made when we ordered it from you. Even the delivery was unique. The two young men who brought the pieces, wrapped in blankets and shrink wrap were absolutely attentive to every detail. There was not a scratch or dent or flaw of any kind. When the blankets were removed we had a wastebasket of shrink wrap instead of a dumpster of boxes. The purchase has been a first class process from start to finish and we thank you for yours and your shipping people’s efforts.